Stellarvue SV115T-20 Telescope in stardust blue on MG mount. Note 6mm accessory mounting holes in rings.
" We start with the proprietary Stellarvue 115 mm f-7 apo triplet lens. We bench test the lens before we begin putting the components together to make a stunningly beautiful optical tube assembly. Once the telescope is complete, Vic Maris star tests each one. The SV115T was a 2-1/2 year project that continues in Stellarvue's tradition of excellence. If you want a razor sharp full apo with color free performance to discern finer details on the planets and extended deep sky objects, this is the telescope for you. This telescope may be used visually, photographically and with binoviewers . . . This is one of the best visual instruments we have made." 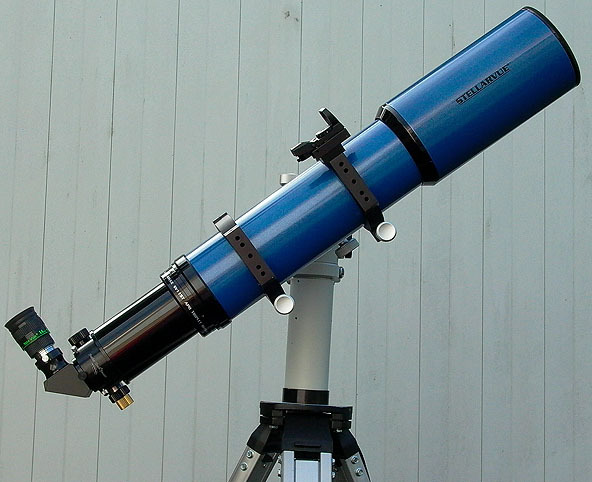 The SV115T is one of Stellarvue's top of the line, Handcrafted Apochromatic Triplet Refractors. These hand figured, edge blackened, full apochromatic triplets are Stellarvue's highest performance telescopes and they are also available with 3.2" (SV80ST), 3.5" (SV90T) and 4" (SV105AT, SVR105-3) apertures. The Stellarvue SVR105-3 Raptor was the subject of an earlier Astronomy and Photography review and based on its superlative performance, we were looking forward to reviewing the SV115T. An 800mm focal length, 4.5" clear aperture telescope doesn't sound particularly big, but triplet refractors bulk up fast as aperture is increased. The SV115T is a large telescope and its triplet objective lens makes it very "muzzle heavy." Even its lens cap is heavy, weighing more than half a pound! Actually, we consider this threaded aluminum lens cap overkill. A snap-in plastic cap would be lighter and more convenient, although not as classy. The 2010 retail price for the SV115T-20 is $3195, direct from Stellarvue. This includes a genuine Starlight Instruments Feathertouch focuser, 1" CNC machined mounting rings with a Vixen dovetail mounting rail and a deluxe C9S padded carrying case. That price does not include a finderscope or mounting system, but you can get $100 off the price of a Stellarvue AZ mount and tripod if you order it with the scope, or the same $100 discount if you order a Celestron CGEM or CGE Pro computerized go-to EQ mounting system. These packages give a good indication of the mounting requirements of the SV115T. Users who prefer a manual (not go-to) German equatorial mount with integral RA and DEC motors (but no manual slow motion controls) should investigate the Losmandy GM 8 S mounting system, which includes their LW tripod. The rechargable Celestron Power Tank is a reasonable power supply for operating the Losmandy drive motors or the Celestron go-to mounts. If you want a German EQ mount with good manual slow motion controls, but without the battery operated motors, the Vixen GPD2 mount with HAL130 tripod (Vixen item #3991HAL130) would be a reasonable choice. One or both motors can be added later, if you change your mind about not wanting to mess with batteries. (The efficient Vixen accessory motors run on AA cells.) This is the same mounting system usually sold with Vixen's 115mm and 140mm refractors. There are two variations on the SV115T theme, the SV115T-20 and the SV115T-35. The difference is the diameter of the Feathertouch focuser that is standard equipment on these telescopes. The "20" comes with a 2" focuser, weighs 13 pounds with mounting rings, is satisfactory for use with most standard format digital cameras and 35mm film cameras and is the model reviewed here. The "35" comes with a 3" focuser, weighs 16.3 pounds with rings and is preferred for astrophotography with large chip digital cameras. We chose the SV115T-20 because it is lighter and we wanted it strictly for visual observervation. It is supplied with a 4" extension tube in front of its 2" focuser that can be removed for direct binoviewer capability without using a refractor adapter. This allows the widest possible field when used with binoviewers. Adapters are required for binoviewing with most other scopes, including the SV115T-35. Unscrewing the extension tube and focuser makes the SV115T-20 airline carry-on length, although we would not want to travel with a scope this big, not to mention this expensive. Zygo and star tested 115 mm clear aperture, 800 mm focal length (f/7) air spaced, apochromatic triplet objective. Fully multicoated with broadband coatings for high performance visual and photographic work. All aluminum Stellarvue Stardust White finish. Ultra flat black interior with knife edge light baffles installed according to the minimal baffle method to provide un-vignetted, full aperture viewing with maximum contrast. External fittings are black anodized. This is a very professional looking research instrument. Aluminum cnc machined deluxe dual mounting rings with five threaded holes on the top and bottom. Holes are centered with one in the center, two spaced 1.5" apart and two spaced 60 mm apart. 5 mm threaded hole for offset multi-reticle finder. Knobs are aluminum with rubber grip and raised SV logo. 4.57" diameter main tube and 5.53" diameter dewshield 9 1/2" long. 115T20: With dewshield retracted, telescope is 21.5" long with extension removed (for airline travel and bino-viewing), 27 1/4" long in normal viewing mode. 5 1/2" longer with dewshield extended. Weight of of ota without rings is 11 lbs. Rings weight 1 lb each. 115T35: 24 3/4" long, 5 1/2" longer with dewshield extended. Weight of ota without rings 14.3 lbs. Rings weight 1 lb each. 2" Starlight Instruments Feather Touch dual speed focuser with 2.5" travel and refractor brake to adjust tension. Compression rings on focuser and 1.25" adapter. Focuser attached to a removable threaded extension tube. Removal of the tube allows bino-viewing without any adapters providing the widest, brightest field of view. 3.0" dual speed Starlight Instruments dual speed focuser with 2" and 1.25" adapters. Draw tube thread for direct attachment to large aperture field flattener. Thickly cushioned, lightweight and durable C9S case with straps. Stellarvue ships their scopes via FedEx, because they have found FedEx to be least likely to damage the scope during its journey to your home. It took about a week for our SV115T and MG alt-azimuth mounting system to arrive. When it did, everything was in good shape with all parts accounted for. We installed the multi-reticle (red dot) finder and checked all the screws and bolts in both the scope and MG mount for proper tension, as some of them had loosened in transit. Assembling the MG mount to the supplied aluminum heavy-duty surveyor's tripod was straightforward, but first we had to remove the oversize mounting bolt supplied with the tripod and substitute the smaller bolt supplied with the MG head. Once both the scope and mount were ready, we balanced the scope on a Vixen GPD2 German Equatorial mounting system. We could have used the new MG mount for this, but the GPD2 mount has less friction than the MG with the RA and DEC locks released. We removed the lens cap, extended the lens hood and ran the focuser out to infinity focus. We installed an Astro Tech 1.25" mirror star diagonal and a 25mm Celestron X-Cel Series Eyepiece to represent a typical viewing load. We immediately discovered that the scope could not be balanced with its mounting rings all the way to the rear of the main tube, as shipped from the factory. With the lens hood fully retracted the two mounting rings with their Vixen dovetail rail barely fit between the lens hood and the rear cell. We moved the rings about 2.25" forward on the scope's main tube, which meant that the lens hood could no longer be retracted all the way, but this allowed us to balance the scope in the Dec plane. It also allowed the scope to fit in its supplied C9S carrying case, although with no room to spare, after we removed the spacers from the ends of the case. To counter balance the SV115T in the RA plane, we adjusted the GPD2's counter-weight accordingly. The Stellarvue one-inch scope mounting rings are CNC machined with broad, flat top surfaces. These are drilled and tapped with five 6mm (standard pitch) accessory mounting holes laid out with one hole in the center and a pair of holes to the left and a pair of holes to the right of the center hole. There is also a single 6mm hole in the side of the ring opposite the mounting clamp hand screw, which we used to mount a Stellarvue deluxe red dot finger. We used the second and third (center) holes to mount an Orion/Vixen shoe to accept the Vixen foot of an Orion 9x50mm right angle, correct image finder scope. We had to enlarge the holes in the shoe for the 6mm mounting screws, but overall it was a simple installation. We think it would be nice if Stellarvue and every other telescope maker provided a Vixen type accssory mounting shoe integral with the rear cell of their refractor telescopes. Vixen, Celestron, Meade and Orion already do. There are also holes drilled in the underside of the rings for attaching Vixen or Losmandy type dovetail mounting rails. With the supplied Vixen rail in place, there is a free hole in the rings on each side of the Vixen rail. These are a good place to install 6mm hex or socket head "stop" bolts to prevent the scope from sliding out of a mount head should the clamp screw loosen. (Unfortunately, this actually happened to a friend with a Stellarvue scope.) Stop bolts are a very pious idea! After nightfall, the first thing we did with the SV115T was to give it a quick visual star test using Vega as the subject. We are happy to report that, as expected, the defocused star image was round with textbook diffraction rings as seen through a 5mm Burgess/TMB Planetary ocular. Did we mention that each SV115T is supplied with a serial numbered factory calibration card? This is initialed by the technician who assembled the scope, the technician who bench tested the scope and by Vic Maris, who performed the final star test ("1.0" in the case of the scope reviewed here). This first look and star test took place on a mostly cloudy fall night in western Oregon. (We get a great many of those.) We were lucky to have a hole in the cloud overhead and even luckier when a second hole opened, revealing a bright quarter moon. Slewing the MG mount around and inserting an 8-24mm Tele Vue Click-Stop Zoom ocular, we were rewarded by a very sharp view of the surface of our binary partner. It is hard to beat the contrast and sharpness (visual snap) of a good refractor for planetary viewing. Perhaps more important from the standpoint of this telescope review is the fact that we could detect absolutely no color fringing on the bright limb of the moon at any focal length. None, zip, nada. The SV115T is indeed a true APO, just as advertised. The very first time we focused the SV115T, we appreciated its Feathertouch dual speed focuser. The Feathertouch is simply the best focuser extant. This model is a 2" diameter, Crayford type focuser with 2.5" of drawtube travel. There are black anodized coarse focus knobs on both sides of the drive shaft and a concentric gold anodized fine focus knob on the right side with a reduction ratio of approximately 10:1. Starlight states that each rotation of the fine focus knob moves the drawtube 0.070" and fine focus repeatability is on the order of 0.0005". Compression rings are used on the focuser and the supplied 1.25" eyepiece adapter. There is a thumbscrew brake to set the appropriate tension to prevent focuser drift when the scope is pointed up. This is easily accomplished for visual purposes by inserting a star diagonal and the heaviest ocular you intend to use and pointing the scope straight up. Screw in the brake screw until the focuser stays where it is set, with no tendency to creep out. Feathertouch focusers are made entirely of aluminum and stainless steel. The aluminum parts are anodized with a hard "black pearl" gloss finish that protects and leaves a subtle rainbow-luster to the surface. All deluxe refractors in this price class should come with Feathertouch focusers and it is surprising that many do not, for in the field a telescope is only as sharp as it can be focused. The finish of the rest of the scope is worth mentioning. The aluminum main tube is "stardust blue," a traditional Stellarvue color, although only ten SV115T's have been given this extra cost finish. Most come with the standard "stardust white" powder coat finish. Stardust blue is a medium blue metalflake finish that we find attractive. When we heard that one of these special finish SV115T's was available, we jumped at it. As classy and well finished as the SV115T is, most prospective owners will be more concerned with their views through the scope than their view of the scope. In that regard, they will not be disappointed. Rather than waste your time by reporting every celestial object at which we aimed the SV115T and comment that it looked wonderful--a staple feature of telescope reviews that is largely worthless--we will merely report that it provides great views of a wide variety of astronomical objects, including galaxies, star clusters, planetary nebulas and planets. Perhaps more relevant, we could detect no optical aberrations while using the SV115T. There is no false color or lateral color error, no coma, no astigmatism, no lens flare and no internal reflections inside the fully baffled tube. The limiting factors are (1) the seeing conditions and (2) the light grasp. You can do a lot with a top of the line 4.5" clear aperture refractor, but you cannot do everything. Of course, no telescope can do everything; there is always the possibility of a bigger or better view with larger, more specialized and more expensive equipment. We would estimate that the general purpose, deep sky viewing performance of the SV115T in good viewing conditions is about equal to a very good 6" SCT reflector with a medium focal ratio (f/8-f/10). The SV115T's superior optics makes up for the reflector's considerably greater light grasp. A very good SCT in the 8", medium focal length range will generally outperform the SV115T under a dark sky in good viewing conditions. It may not be as contrasty or have the same visual snap, but it will reveal dimmer objects. Of course, that is only true if the seeing conditions permit such faint objects to be visible in the first place, which unfortunately is often not the case. On the other hand, medium size refractors are easier to handle, maintain and set-up than big reflectors and less subject to damage from handling and transportation. Refractors very seldom (usually never) require collimation. They are therefore likely to be used more frequently. One thing is for sure: if it is too much trouble to set-up your telescope, you won't see anything through it. That is why we ordered the convenient Stellarvue MG alt-azimuth mount with the SV115T, even though we already had a good German EQ mounts on hand. An AZ mount requires no alignment; it is a "grab and go" type of mount that encourages the scope to be used for quick looks at anything that appears interesting. One of Stellarvue owner/designer Vic Maris' stated philosophies is, "a telescope that is easy to use will be used often." During our many years of involvement with amateur astronomical telescopes, we have found this to be very true. The SV115T is a nearly perfect blend of convenience, portability and light grasp in a beautifully made, top quality telescope with stunning optical performance.